Summary: Leaders at the NWP site at Rutgers University describe how they reframed their annual conference, in which new teacher-leaders first present their work, as a more informal series of Saturday workshops. The workshop series preserved the opportunity for new teacher leaders to conduct their first professional development session while eliminating the costs of a formal conference (keynote, food, etc.). In addition, the site also shares its unique model for assuring a predictable number of attendees. 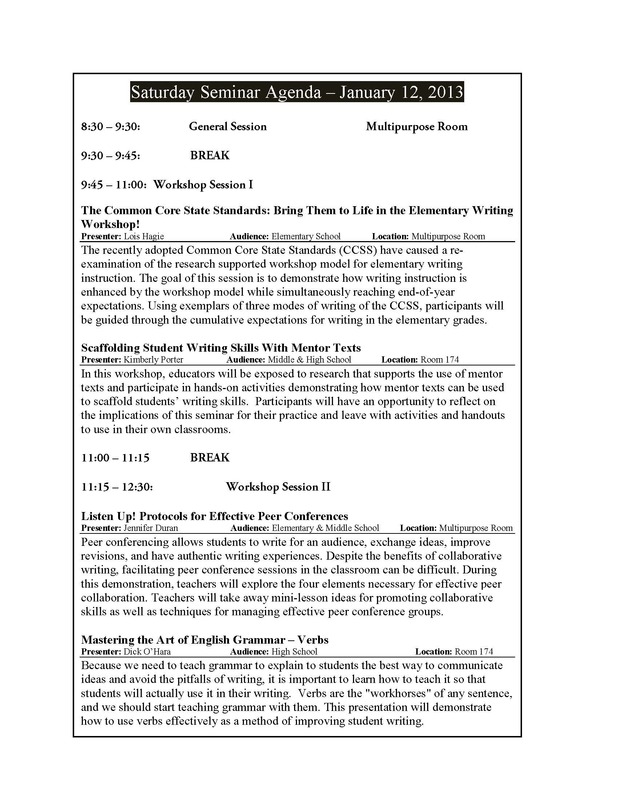 Includes a sample workshop schedule. Due to the need to rethink an expensive annual conference, NJ Rutgers decided to offer Saturday Seminars, making adjustments that led to more efficiency. Our site is very proud of our annual conference that debuts the demos of our most recent SI cohort. It was never an event we considered eliminating; instead we worked on growing and improving it. However, changes at the university and in funding forced us to rethink our approach…. We were in agreement that the most important aspects of the conference were connected to our newest TCs. In preparation for presenting at the conference, TCs participated in two mentoring sessions where an experienced TC assisted with demo retooling. Together, the mentoring and presenting were two of the activities that ushered the newest cohort into the fabric of our site. And so Saturday Seminars were born! No keynote speaker, no food, and no charge – just quality professional development. Not charging for the workshop increases our access but it also means less administrative hassle. Since we’ve had limited success with offering free workshops in the past, we made a little adjustment though. In general, the issue was that people sign up but do not show up. Therefore, we required a refundable deposit. Registrants send a check for $25 to secure their spot. We return the check on the day of event and only cash it if the person does not show for the event. People are so happy to get back their checks, and we find we have few no shows…. Our plan for next year is to offer three seminars (fall, winter, spring). For our site, Saturday Seminars are a reminder that we need to view our programs with an objective eye. Just because we have always done it a certain way, doesn’t mean there isn’t room for change.